Carla D. Chugani, PhD, LPC, is a postdoctoral scholar in the Department of Pediatrics, Division of Adolescent and Young Adult Medicine, at the University of Pittsburgh and licensed professional counselor currently practicing DBT at Western Psychiatric Institute and Clinic, Pittsburgh, PA. Prior to her doctoral studies, she worked as a college counselor and developed a DBT program for Florida Gulf Coast University. As such, she is intimately familiar with the implementation challenges and solutions associated with DBT programs on college campuses. 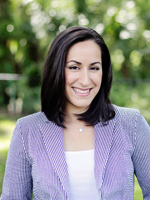 She has conducted outcome research demonstrating the effectiveness of brief DBT interventions with college students, implementation research specific to the college counseling practice setting, and also partnered with Behavioral Tech, LLC to co-host the first DBT Intensive Training in the State of Florida. She is currently working on intervention development and implementation studies designed to approach suicidality on campus via novel interventions targets and brief DBT-informed approaches. She is honored and delighted to join Behavioral Tech.